The wheelchair rugby community is often referred to as the “wheelchair rugby family.” Whether you’re a newly injured athlete looking to get involved for the first time, a former athlete looking to rekindle your career, or a potential coach, support staff, medical staff, referee, classifier or volunteer, there’s a place for you in Canada’s wheelchair rugby community. The sidebar links will tell you exactly how to contact a club member and take your “first push” into a new career. Whether you want to play recreationally or you have Paralympic dreams, every wheelchair rugby career begins with a first push. In this video, members of the national team describe how their first time playing wheelchair rugby. Wheelchair rugby is the most exciting sport on four wheels and we’re always looking for new participants. Luckily, getting involved is easy. Follow the steps below to see how you can begin your murderball career. Wheelchair rugby is a co-ed sport that welcomes athletes of all ages and abilities. Like other wheelchair sports, however, it has a classification system that ensures that it remains a sport for athletes with disabilities that affect both the upper and lower body. Athletes are evaluated by a panel of physiotherapists and doctors and given a point value that corresponds to their functional ability. In wheelchair rugby, the point system moves in 0.5 increments from 0.5 (for most disabled) to 3.5 (for least disabled). A team cannot play more than four athletes totaling 8 points on the floor at any one time. Learn more about classification. To find out if you’re eligible, take this quick quiz. Are you over the age of 13? (Unfortunately, because of the hard-hitting nature of the sport, wheelchair rugby does not have a junior program). Do you have a spinal cord injury that affects at least three limbs? If not, do you have another condition (cerebral palsy, polio, muscular dystrophy, amputation, etc…) that affects all four limbs? If you answered yes to all of these questions, you may be eligible for wheelchair rugby. Attend a “Have a Go Day:” The Bridging the Gap program offers a series of ‘Have a Go’ days where you can try a variety of wheelchair sports in a fun, supportive environment. Learn more about Bridging the Gap. Contact a local club. Check out our Clubs section to find a program near you. Programs often have spare wheelchairs and other equipment that they can lend you to ensure that you have a positive sports experience. If these two methods are unsuccessful, please contact info@cwsa.ca and ask to be connected to the appropriate contact person. Clubs all over Canada are looking for experienced coaches and referees. Whether your experience comes from a para-sport or an able-bodied sport background, we offer several wheelchair rugby coaching and refereeing clinics to get you up to speed. To get involved, fill out the form on the below and we will contact you shortly. Thank you for your interest in wheelchair rugby! 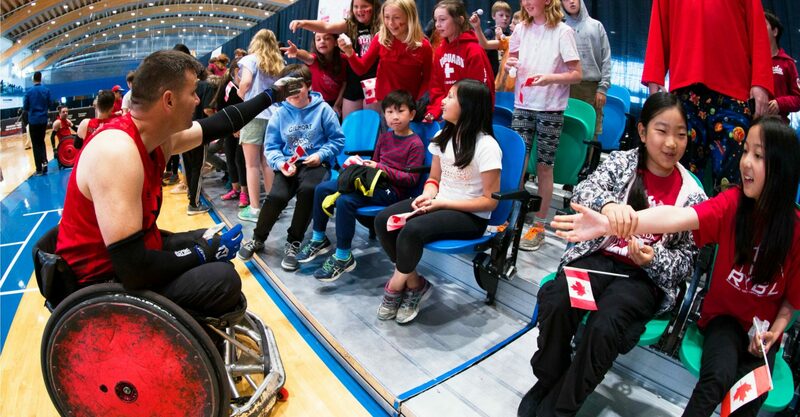 To ensure that every wheelchair rugby coach has the skills necessary for success, the NCCP and the Canadian Wheelchair Sports Association have worked together to develop a Coach Development Model. 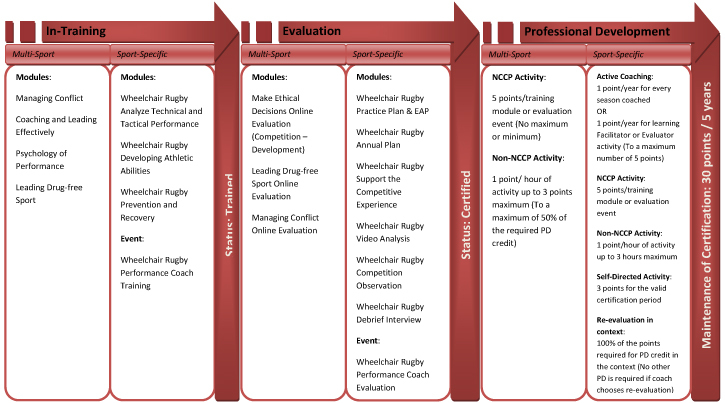 This model guides coaches as they develop their skills. 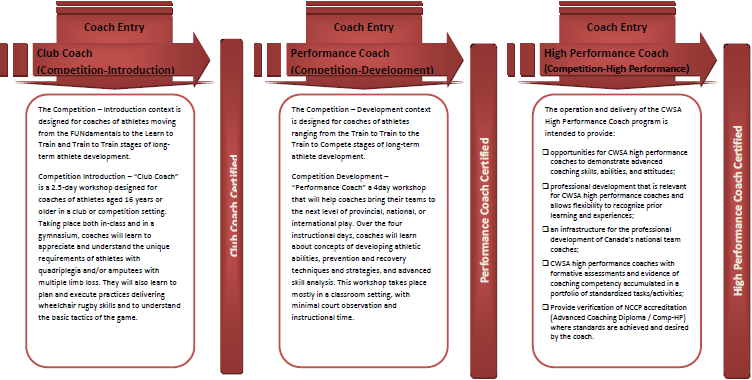 You can become one of three types of coaches: a club coach, a performance coach, or a High Performance Coach. A club coach is focused on grassroots, beginning, developing and recreational athletes, while a performance coach coaches athletes with a high-performance focus, such as a provincial or national team. High Performance Coach education is customized and personalized based on the needs of the coach, to give the coaches the knowledge to demonstrate advanced coaching skills, abilities, and attitudes. Either way, the instruction you receive under the NCCP Coach Development Model will help you become familiar with the unique needs of athletes with quadriplegia and/or multiple limb loss. In-Training: The coach completes several modules and attends a wheelchair rugby club coach course. After this step, the coach is classified as being trained. 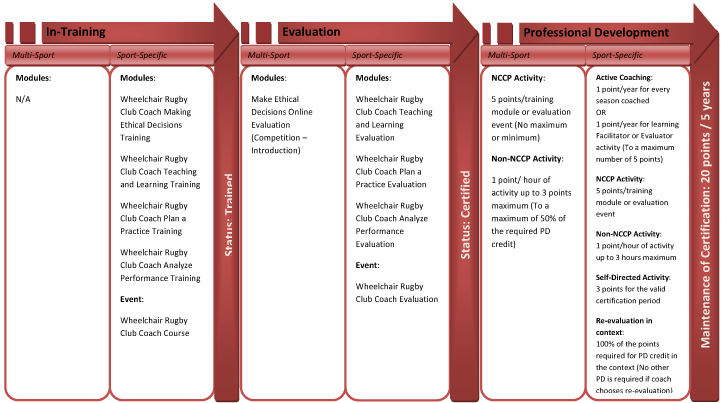 Evaluation: The coach is evaluated by a learning facilitator and completes more modules. After this step, the coach is classified as being certified. Professional Deveopment: To maintain certification, the coach earns points for completing professional development activities. Active club coaches must earn 20 points over 5 years, while active performance coaches must earn 30 points over 5 years. Got some skills to share with us? Clubs all over Canada are looking for volunteers. Whether you have refereeing experience, come from a physiotherapist/medical background and want to be a classifier, or just want to help out where needed, we can find a place for you.